and surrounding area for the second time. 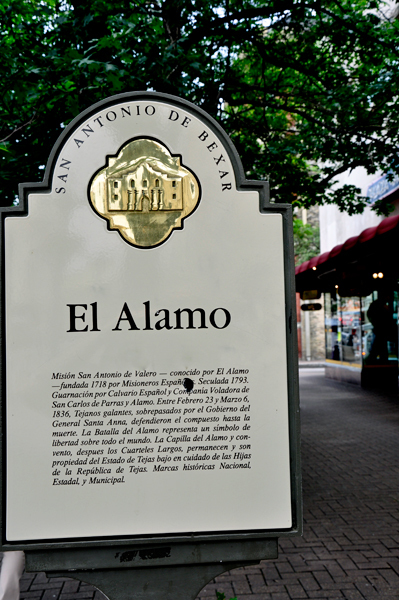 FYI: First a bit of history as quoted from http://www.thealamo.org/education/fun-facts.html. If you do not like history, scroll down past the history section to the photos. 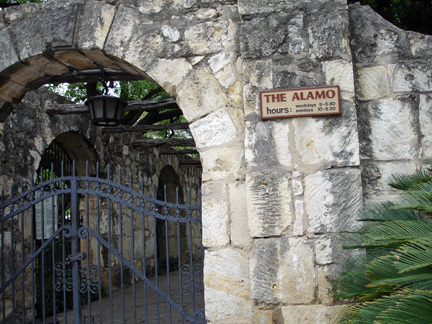 The Alamo began as the San Antonio de Valero, a Spanish Mission, in the early 1700’s, one of the first in Texas. 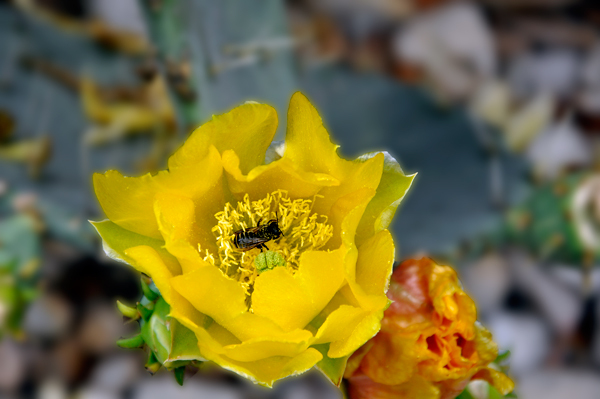 The establishment of this mission played a crucial role in the settlement of San Antonio, Texas and the Southwest. 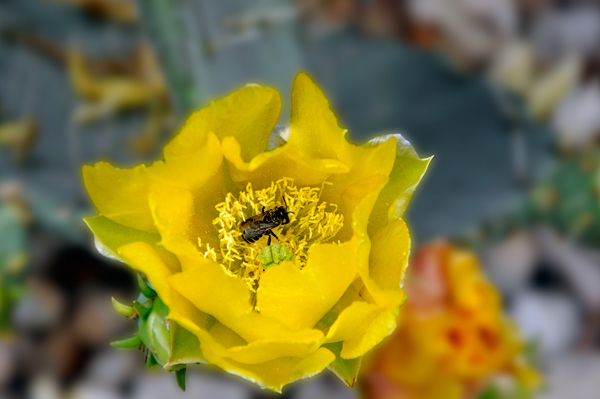 The San Antonio de Valero Mission was built to provide local indigenous people, or Indians, with protection from hostile tribes and conversion to the Catholic faith, the state religion of Spain at that time. 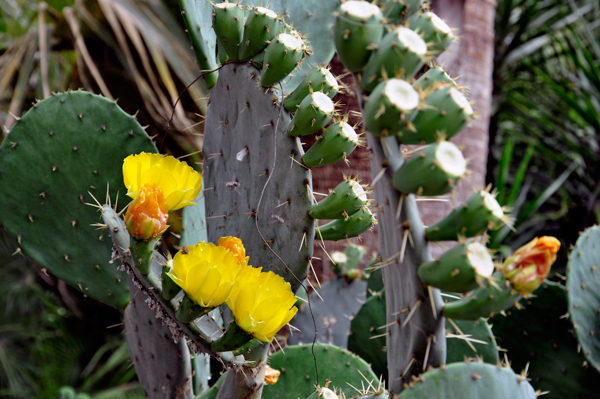 Accordingly, the first residents of San Antonio de Valero were members of Indian tribes like the Payaya, Sama, Pachaque and other Coahuiltecan Indian tribes. Spanish missionaries provided religious services and directed the work of those residing inside the Mission. Those residents who died in the mission were often buried in front of the Church, according to Spanish tradition. 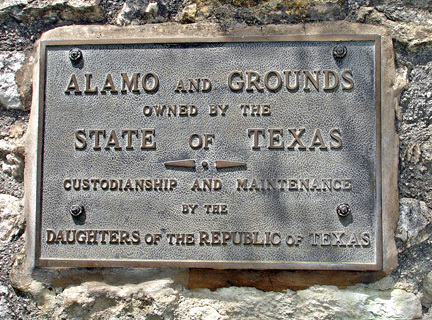 Consequently, the area in front of the Alamo Shrine represented with a patch of green grass, the Campo Santo, is considered hallowed burial ground. 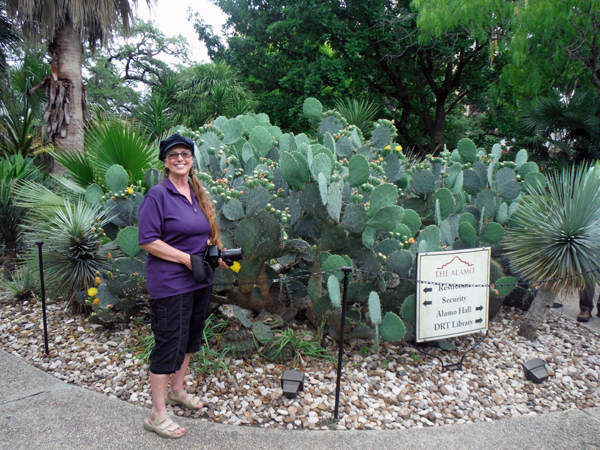 "Mission San Antonio de Valero" has not always been at this location. 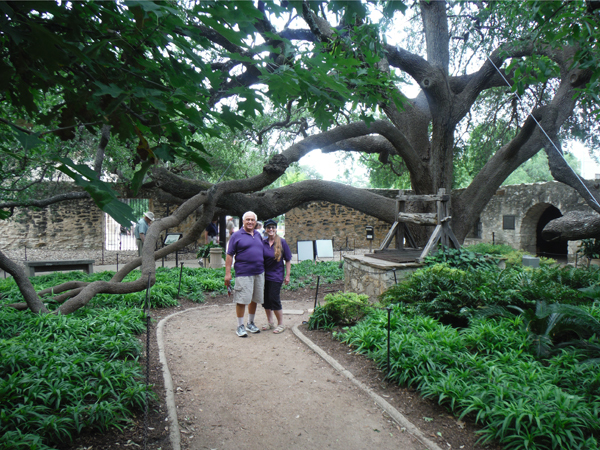 The original mission was founded near the headwaters of San Pedro Creek in 1718. 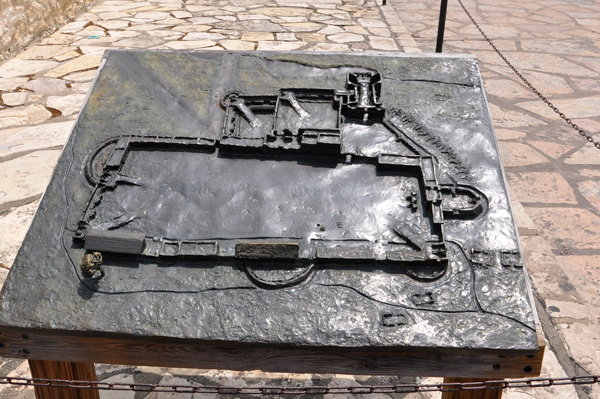 In 1719 the mission was relocated a short distance to the south of where we are today. A 1724 storm destroyed structures at the new site, prompting Spanish officials to relocate the mission to its present spot. 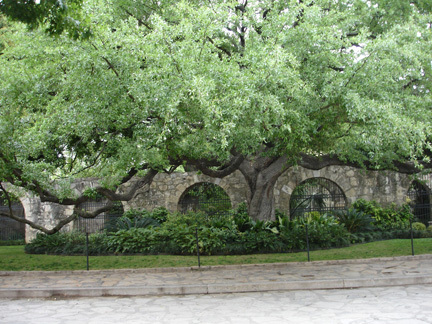 It was the mission compound constructed here at the 1724 location that later gained fame as the Alamo. 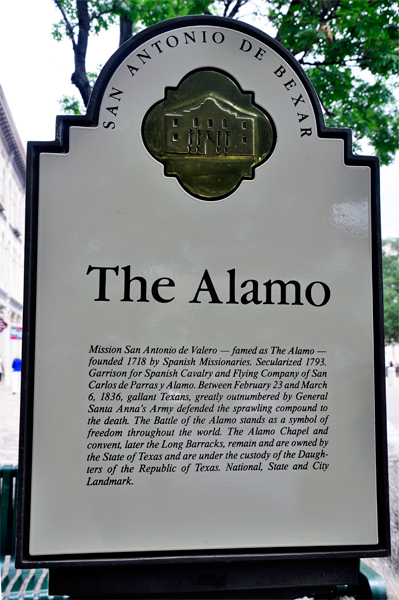 While this is the third spot for Mission San Antonio de Valero, it is the only place the "Alamo" has ever been. 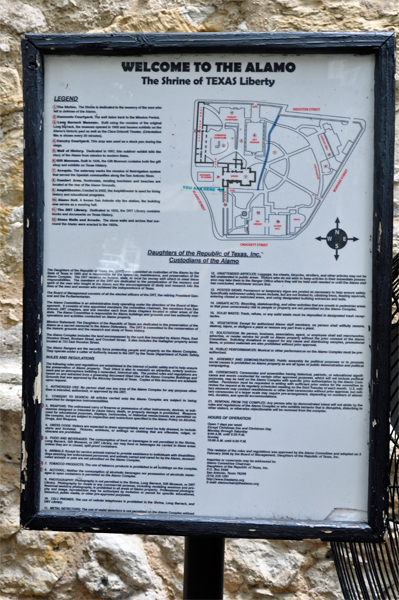 Construction of the Convento (or Long Barrack) began in 1724, shortly after the mission was relocated to this site. Records indicate it was completed in 1744. That makes it more than 250 years old. The Long Barrack has undergone several renovations and reconstructions. In 1847 the U.S. Army repaired the structure: drawings from that period show it with two full stories. 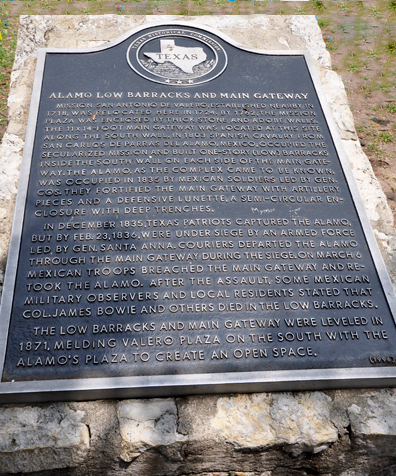 By 1876 the military had relocated their facilities to what would become Fort Sam Houston. During the 1870s and 1880s, merchants used the Long Barrack as a store. A wooden framework constructed to resemble a fort covered much of the Long Barrack. The wooden framework and the second story were stripped away in 1913 in an effort to remove the "unoriginal" portions of the building, leaving only the walls standing. 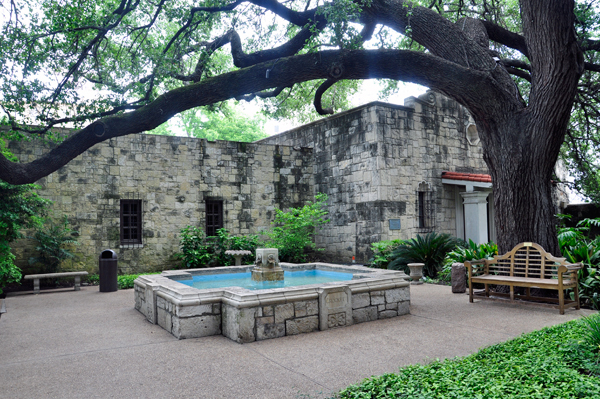 The walls were repaired and roofed in 1968, as part of the renovations to the Alamo for HemisFair, creating the Long Barrack Museum. Construction on the church began in 1744. By 1756, however, the walls collapsed, prompting construction on the present church. All work ceased by 1762. Neglected, the roof arches and bell towers fell, filling the building with rubble. 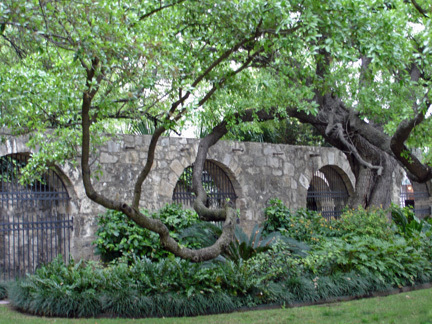 The church was fortified by both the Mexicans and Texans during the Texas Revolution, when the rubble was moved to the east end of the building to form a cannon platform. After the battle, the church remained in ruins until the U.S. Army began repairs in 1850. They added a gabled roof (the first time the church had a complete roof) and the "hump" to the facade. Like the Long Barrack, the church also underwent a mercantile phase following the army's departure. While the walls of the church are nearly 250 years old, the building has only had its world-famous look for 150 years. 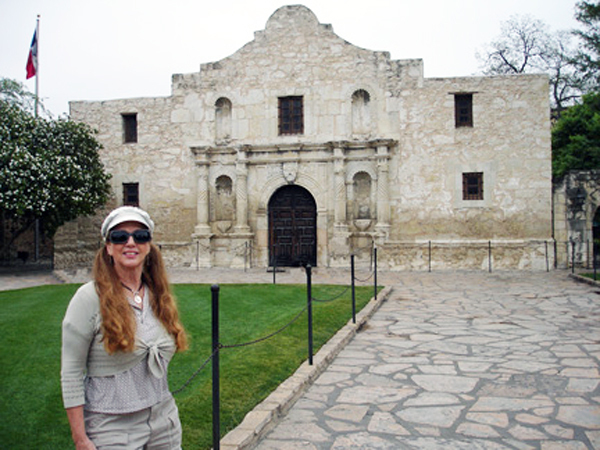 What Happened At The Alamo After The Battle? 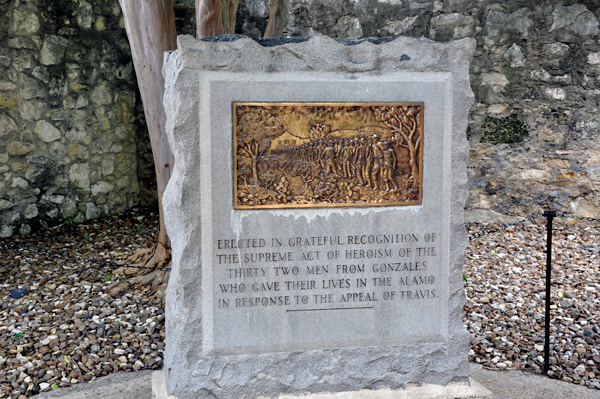 The Mexican Army maintained control of San Antonio until May 1836. 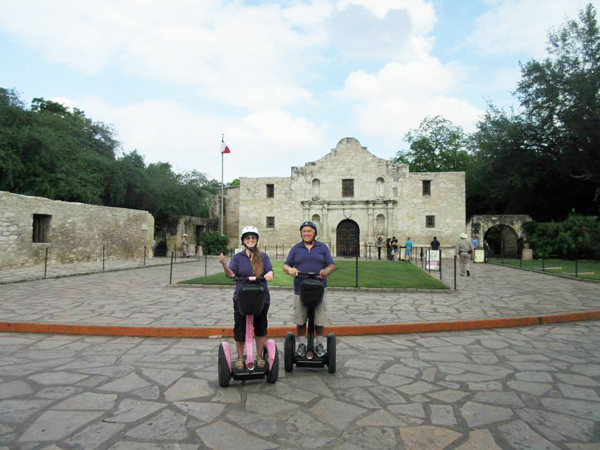 That month the Mexican garrison received orders to demolish the Alamo before they withdrew. They knocked down some of the outer walls of the compound, including the log wall known as Crockett's Palisade, so it could not be easily refortified by the Texians. 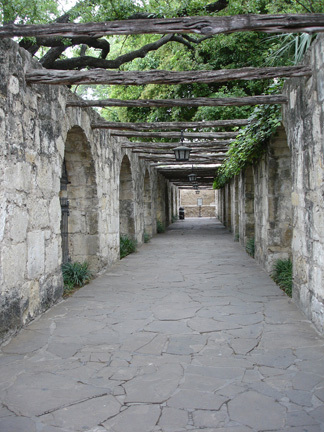 Many of the wounded Mexican soldiers were housed in San Antonio following the battle. 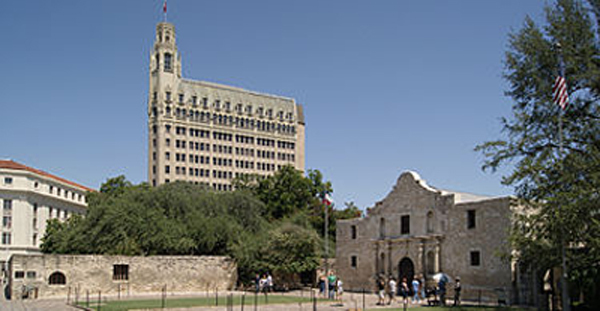 Several Texian doctors captured with Fannin's command were sent to San Antonio to help tend Santa Anna's wounded, who were then evacuated in May and June during the withdrawal. 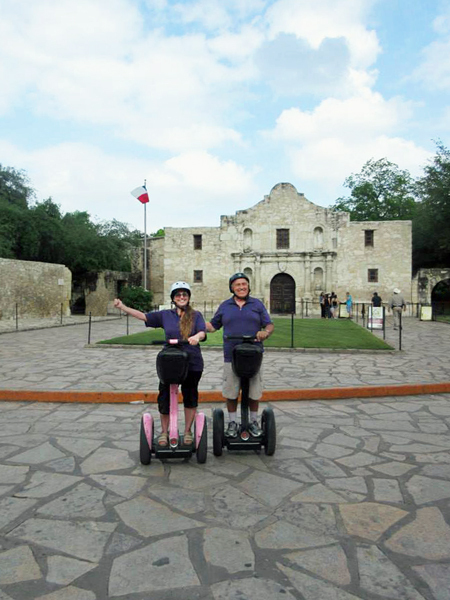 As of 2002, the Alamo welcomed over four million visitors each year, making it one of the most popular historic sites in the United States. 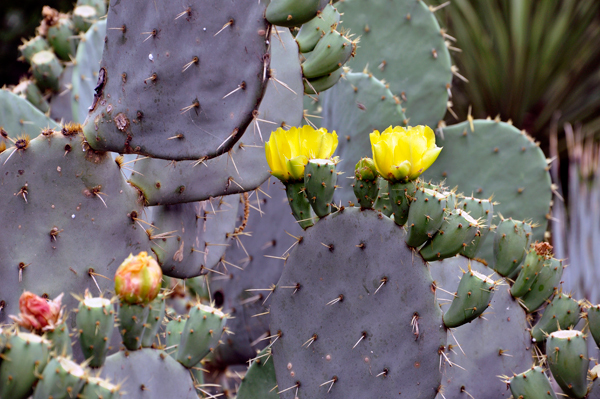 Visitors may tour the Chapel as well as the Long Barracks, which contains a small museum with paintings, weapons, and other artifacts from the era of the Texas Revolution. 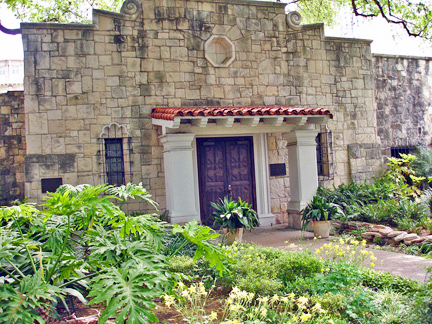 Additional artifacts are displayed in another complex building, alongside a large diorama that re-creates the compound as it existed in 1836. 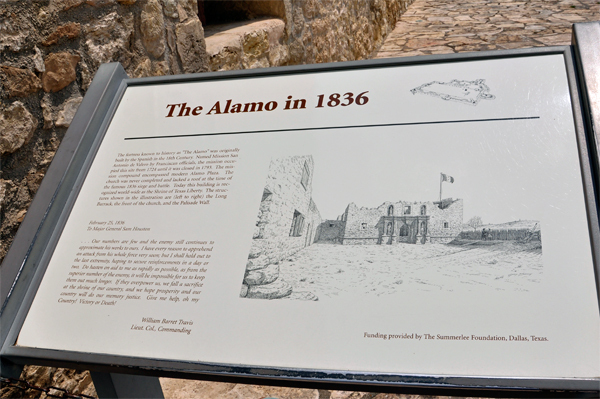 A large mural, known as the Wall of History, portrays the history of the Alamo complex from its mission days to modern times. 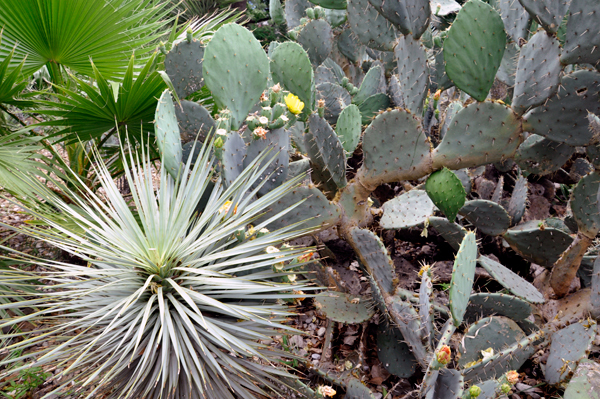 There is also a gift store and cactus garden area. 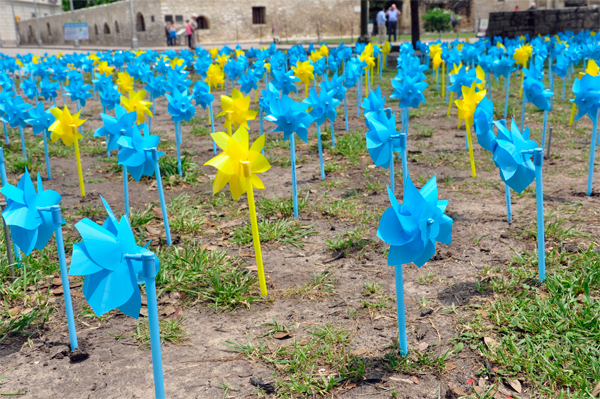 May 6, 2015 - a special presentation with a "pinwheel garden" in front of the Alamo. 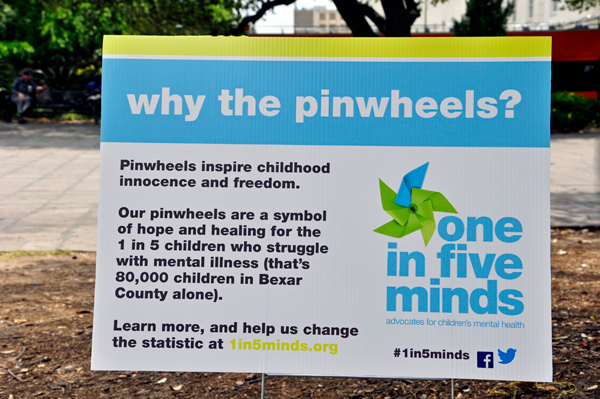 Volunteers gave Karen a pinwheel to keep. 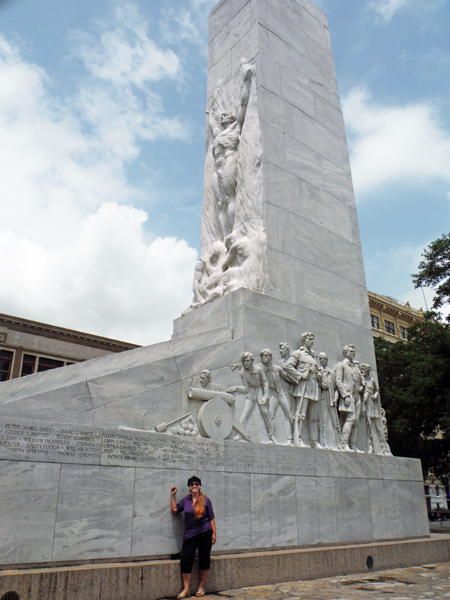 Towering 60 feet high and located adjacent to the Alamo itself, San Antonio's Alamo Cenotaph pays tribute to the men who died defending the ancient mission in 1836 rather tan surrender to overwhelming odds. Titled "The Spirit of Sacrifice" the Cenotaph (or empty tomb) took two years to complete and is itself now a historical treasure. 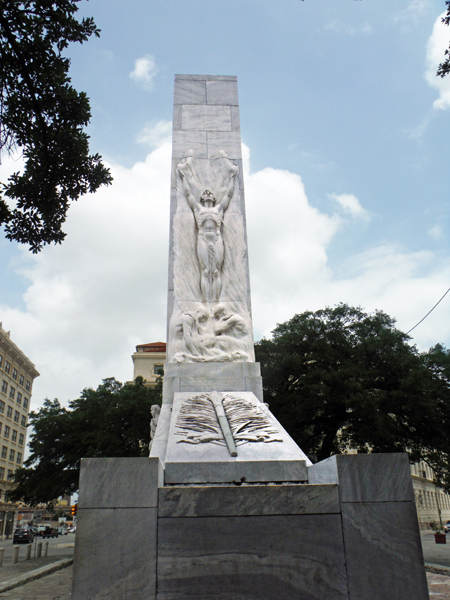 The monument is sculpted from Georgia marble and stands upon a bas of pink Texas granite. The base of the sculpture is 12 feet by 40 feet. 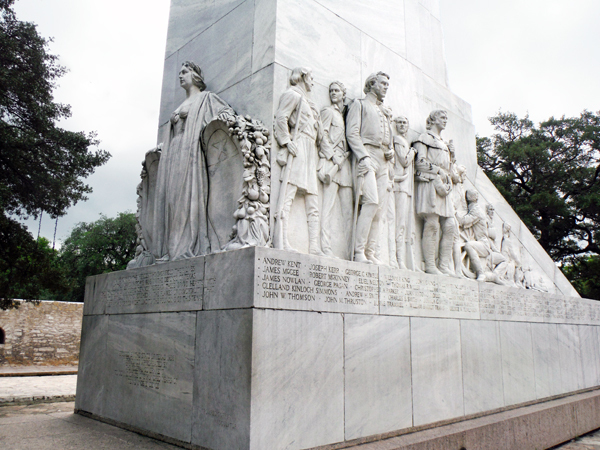 Seen on the sides of the Cenotaph are carvings of the Alamo defenders, including depictions of William B. Travis, Jim Bowie, David Crockett and James B. Bonham. 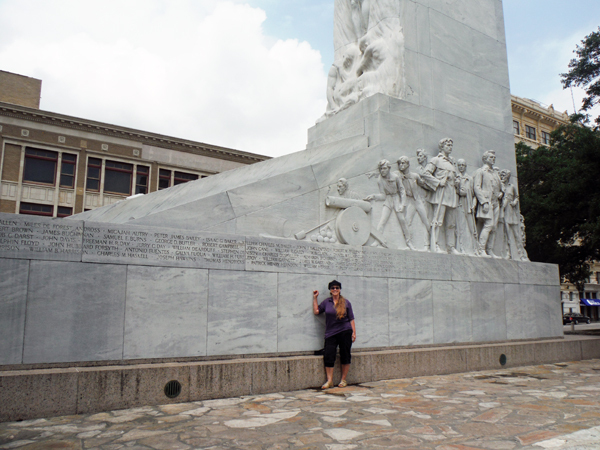 The monument also bears the names of men who died at the Alamo. 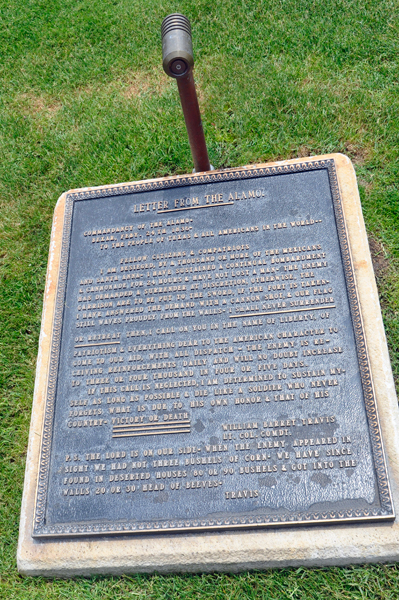 In addition, the following inscription can be found on the memorial: "They chose never to surrender nor retreat, these brave hearts with flag sill proudly waving perished in the flames of immortality that their high sacrifice might lead to the founding on this Texas." 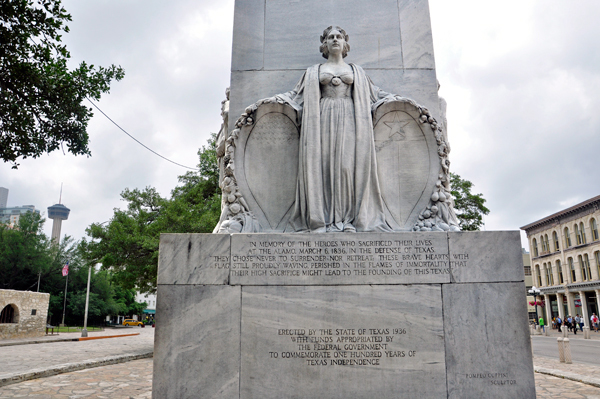 The south side of the Monument has a 25-foot tall "Spirit of Sacrifice"
The North side of the Monument has a female figure representing Texas.